"I selected the 323 as it was a drink I developed to celebrate the opening of a bar I was involved with in NYC ,called Bar Milano, which was located at 323 3rd Avenue. It was designed to be flexible of fresh ingredients. " French fries, really good French fries! The side dish can be the half chicken at LeCentral in SF, the steak at Bouchon or the fried pickerel at Chicken in the Rough in Port Huron, MI. One tattoo on my right rear shoulder that I got with a fellow bartender Mike Wheeler in 1986 when tending bar at McNally's Irish Pub in Oakland. I guess we were ahead of the trend. Open a cocktail lounge in Las Vegas! I would want to be like Aqua-Man! – I love the ocean and love to scuba dive, this would be better! Rosemary Gin: First, rinse one large sprig of fresh rosemary and place it inside a 750 ml bottle of Hendrick’s gin. Store in a cool place for a week to infuse. Remove rosemary sprig and get ready to enjoy a 323 with friend! Reduced Balsamic Vinegar: Begin with one liter of balsamic. In a saucepan bring the vinegar to a boil over a high heat and whisk the vinegar constantly to prevent burning. Add one tablespoon of sugar and continue to whisk until the mixture is reduce by half or takes on a syrupy consistency. Remove from heat and allow to cool. In a mixing glass, add strawberries, basil leaves and reduced balsamic vinegar; muddle. Add Hendrick’s and lemon sour. Shake with ice until well blended. 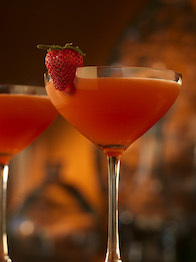 Double strain into a chilled cocktail saucer and garnish with a half strawberry heart. Tony Abou-Ganim grew up in the bar business, learning the craft from his cousin Helen David at the Brass Rail Bar in Port Huron, Michigan. His initial introduction to the business was steeped in the tradition of classic cocktails and professional barmanship, teaching him the necessary steps to become a leader in the beverage industry. In 1993, he moved to New York City and took a position as the opening bartender at Po, Mario Batali’s first restaurant. Tony is widely regarded as one of the pioneering and leading bar professionals in the world. He has made dozens of national TV appearances on shows including TODAY, Iron Chef America, Good Morning America, CNBC, Fox News, and more. 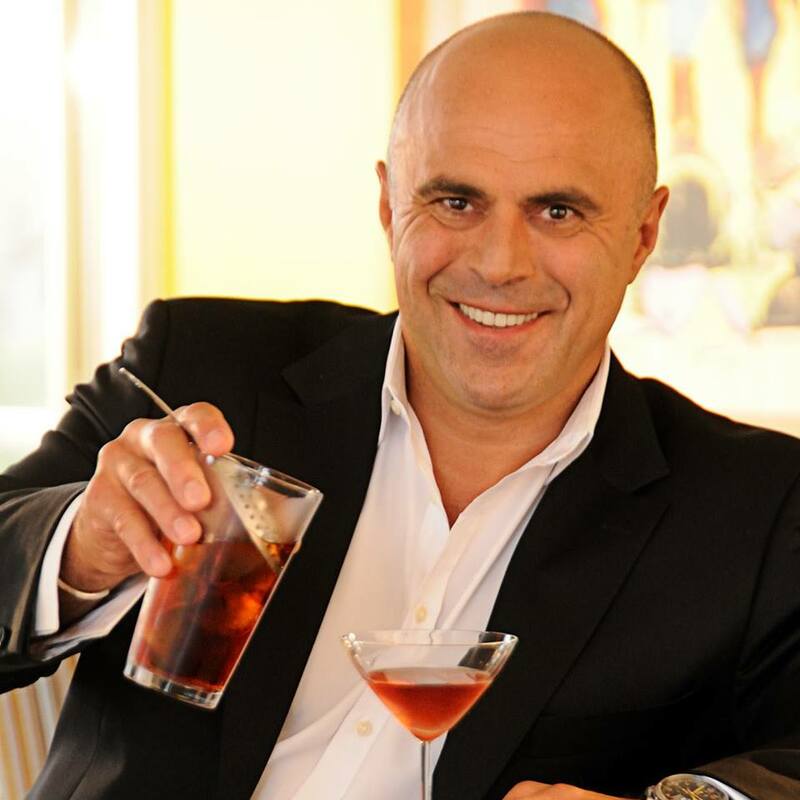 Abou-Ganim is the author of The Modern Mixologist: Contemporary Classic Cocktails (Agate, 2010), which offers readers an in-depth look into spirits and ingredients available to today’s mixologist, both professional and amateur alike. This entertaining and informative journey will take readers from the early stages of the cocktail to what Abou-Ganim has come to deem “Modern Mixology.” Abou-Ganim also has a DVD to his credit, Modern Mixology: Making Great Cocktails at Home, and hosted the Fine Living program Raising the Bar: America’s Best Bar Chefs. Abou-Ganim has also won THREE Iron Chef America competitions; pairing cocktails with Iron Chef Mario Batali; with Iron Chef Jose Garces and most recently with challenger Chef Shawn McClain!